Dhaka, 14 May, Abnews: Millions of people around the world prefer coffee to any other drink. Indeed, there are many options to choose from — espresso, with or without milk, hot, iced... But what’s even more impressive is how many uses this popular beverage has besides drinking. And some of them have nothing to do with cooking. At Bright Side we made up a list of cool things you can do with coffee other than drink it and we want to share them with you. Who can resist the magical smell of fresh coffee? Don’t you want to come in every time you pass by a coffee shop and inhale the amazing smell of freshly brewed coffee? So why not try coffee as a hand deodorizer? Use coffee grounds to remove the garlic or onion smell from your hands — rub thoroughly and rinse with water. Done! Your hands smell like coffee. Apart from its amazing smell and exquisite taste, coffee has a number of benefits for the skin. Coffee grounds remove dead skin cells and provide an anti-wrinkle effect due to their antioxidantcontent. This makes coffee grounds one of the best products for your skin. You can use ground coffee right on your face or try it in different face masks. • Leave for 20 minutes and wash with warm water. Apply moisturizing cream after the procedure. You’ll notice the results right away! This mask also brings you the advantages of baking soda, which effectively cleanses oily skin. It’s happened to all of us at least once — you open the fridge and you know by the smell that something has gone bad in there. Strong odors from fish or spicy food are very stubborn. So, how do you solve the problem? Coffee effectively fights unpleasant smells in the refrigeratorjust like it removes bad smells from your hands. Place a cup of leftover coffee in the refrigerator. Coffee will absorb strong odors, and your problem is solved. The majority of over-the-counter anti-cellulite creams have one ingredient in common. That’s right — caffeine. The problem is that all of them are quite expensive, so if you have coffee at home, why not make a good use of it? You can make your own anti-cellulite treatment by mixing leftover coffee with some coconut oil. Apply to the affected area and massage in circular motions for a couple of minutes. Rinse with water. There you go! A much cheaper way to address your problem and, in addition, you recycle your coffee. It turns out that your dog can also benefit from coffee grounds. How is this possible? Due to its strong smell, coffee can be used as a DIY treatment to repel fleas and keep these unpleasant blood sucking parasites away from your pet. After you’ve given your dog a bath, rub it with leftover brewed coffee. This also brings the extra benefit of preventing your dog from smelling like a wet dog. Instead, you’ll now have a dog that smells like coffee! Don’t try to have a taste, though! Coffee has a number of beauty uses. You can try it on your skin, and it works amazing on hair too. Not only does it make your hair glossy, but caffeine is also a great remedy to deal with hair loss because it stimulates hair growth and makes it feel soft and nourished. • Brew some coffee — the amount should be enough to cover all of your hair. • Let it cool and then apply to your hair. Massage the scalp in circular motions. • Leave for about 20 minutes and then rinse with water. • You can use this DIY treatment once a week. This one is unexpected, huh? It turns out that coffee can enrich and nourish your garden soil with nitrogen. It can be used to make compost, but make sure the amount of coffee doesn’t exceed 20%. Otherwise the compost would be over-concentrated with coffee and the effects would be negative to your garden. Keep in mind the recommended proportion and mix coffee with compost. It’ll improve your garden soil and can also be used for your potted plants. If you have a backyard, a terrace, or a garden, you’ve definitely been visited by a neighbor or a stray cat at least once. Those visitors love to urinate on your houseplants or just all around your favorite places. Coffee is an option to scare them away without hurting them. Apparently, most cats can’t stand the strong smell of coffee and it usually turns them away. Just leave some ground coffee mixed with citrus peels in the right places and cats will avoid your garden. Coffee is a great natural exfoliant that helps remove dead skin cells. You can prepare your own exfoliating treatment by mixing ground coffee (used or fresh) with some olive oil and use the scrub on the areas of your body you want to exfoliate. Leave for about 15 minutes and rinse with warm water. If you can’t stand the scent of your new air freshener or you simply don’t want to fill your house with chemicals, using coffee as a natural air freshener would be the best option for you. If it works with refrigerators, it will work with your living room too. Put some used and dry coffee grounds into a nylon stocking that you no longer use and place it in the room you want to refresh. You can do the same for your car or your closet. 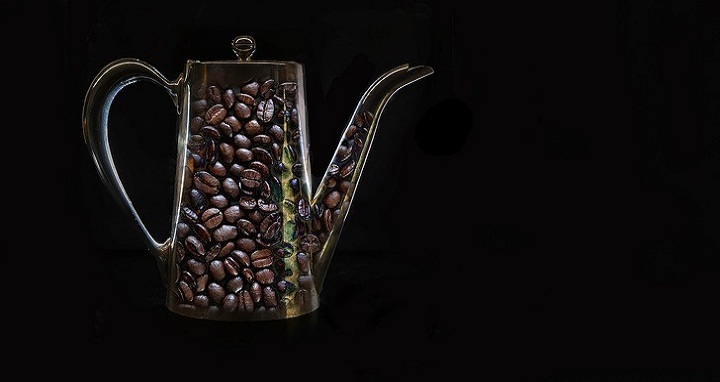 Coffee is also very useful for making your wood furniture shiny and clean. Instead of throwing coffee grounds away, let them cool, and using a cloth, rub over the surface of your favorite piece of wood furniture. Not only will this make your furniture shiny, but you’ll also appreciate the refreshing smell of coffee in your house. Don’t you think coffee beans are beautiful? Plus, the amazing smell of fresh coffee somehow gives a sense of well-being, doesn’t it? Coffee beans are often used as a decorative element to give your favorite place a nicer look.You can use your creativity and imagination, but here is just a very simple and cute decoration idea: buy a transparent bottle (or any other glass container) and fill it with coffee beans. Put the bottle somewhere on a piece of furniture, like an end table (the one you’ve polished with coffee grounds! ), and you will have a nice creatively designed item in your house. If you like drinking coffee, you’ll also love eating it. • Use instant coffee to decorate cakes and other desserts. • Use instant coffee for glazes and fillings. • Use brewed coffee for cakes and cookies.